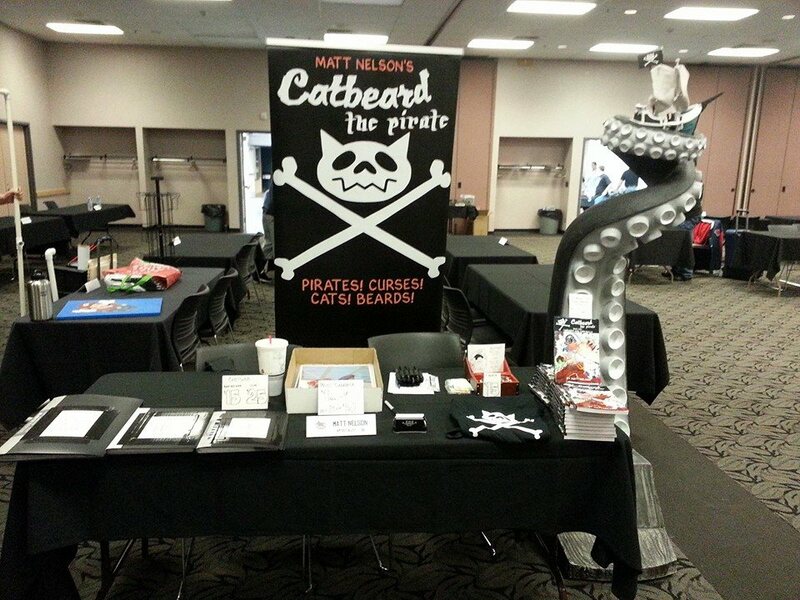 Spokane Comicon 2014! – Catbeard the Pirate! Well, another con is in the bag and I had an absolute blast. It was the most successful con I’ve ever had, bar none, and I got to meet a lot of cool folks. I decided this year to get out of the print game (at least of characters I don’t own) and so I marked the last of my old prints down to a buck each and blew them out of my stand. The big sellers, though, were shirts and original art. Not as many books as before, but I think being sold out of Book One of Catbeard worked against me. Still, I did sell some of Book Two, which included the Free Comic Day issue so people could read his origins. Definitely gotta get that reprint done, though. 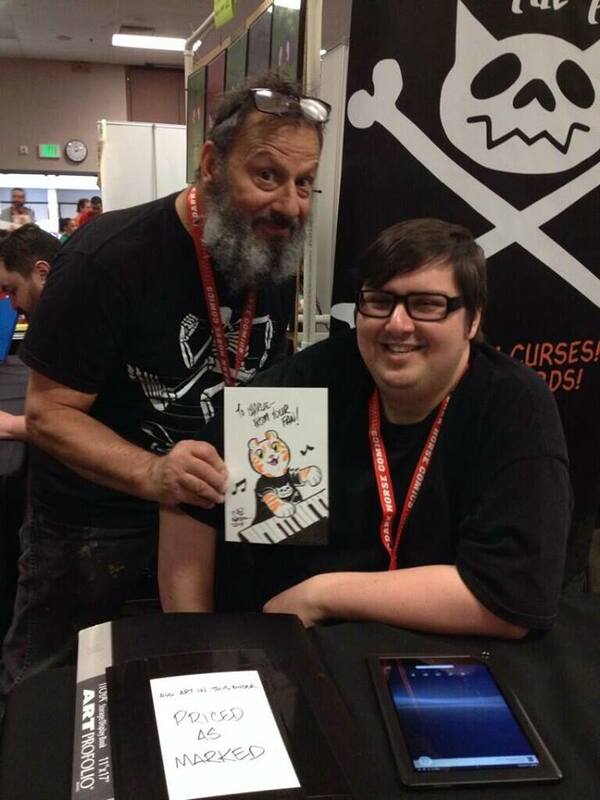 I also got to meet Charlie Schmidt, originator of the internet meme Keyboard Cat (something that makes me laugh). He’s been to Spokane Comicon nearly every year, but I finally worked up the nerve to talk to him this year. I didn’t get to meet Bento, the current Keyboard Cat (who was also there briefly) because his line was HUGE, and the little guy could only deal with so much before he had to go home. I ended up buying one of the Keyboard Cat piano-playing dolls, which are apparently becoming pretty rare. I also drew Charlie a Keyboard Cat wearing a Catbeard shirt. 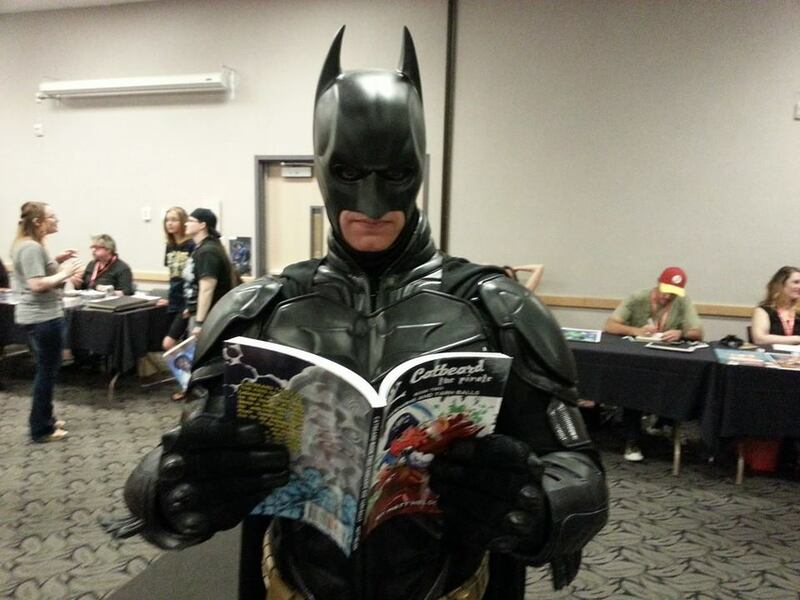 Spokane Batman came by my table and I got to snap a pic of him reading the Catbeard book. He’s a local cosplayer who does a lot of charity events and appearances, and his Batman costume is really top-notch. He looks great in person. All in all, the con was a ton of fun. I seriously wish I could just live at comicons. I included some photos of my table display, me and Charlie, and Spokane Batman for your perusal.